The Murray-Darling Basin Authority has developed guidelines to help people understand trade rules in the Basin and give them much better access to market information, regardless of which state they operate in. The guidelines are technical documents for people familiar with the water market. As such, there is a degree of assumed knowledge and familiarity with technical terms. 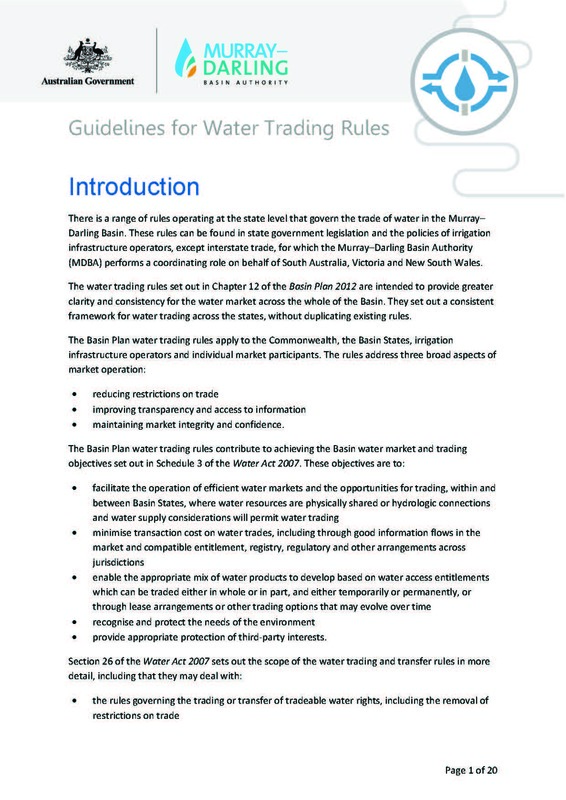 This guideline will help in understanding water trading rules. It contains general information applicable to all of the water trading rules and should be read with other guidelines. The water trading rules require people who sell or dispose of water access rights to declare their sale price. This requirement will help market participants in making informed decisions about buying and selling water by increasing the quality of price information. The water trading rules require Basin States to allow the free trade of surface water. The rules provide that a person may trade a water access right free of any restrictions on changing the location water is taken and free of any restrictions which impose a volumetric limit. The free trade of surface water is required except where a restriction meets certain necessary criteria. These criteria include physical constraints, to address hydrologic connections and water supply considerations or to avoid harming the environment. These rules aim to remove barriers to trade and facilitate trade opportunities for water market participants. An infrastructure operator is defined under the Water Act 2007 as a person who operates water service infrastructure for storing, delivering or draining water. An entity is considered to be irrigation infrastructure operator (IIO) if it operates water service infrastructure for the purpose of delivering water for irrigation, and their 'infrastructure' is an 'irrigation network'. These rules aim to contribute to a more efficient and effective market by facilitating opportunities to trade and improving access to information. An approval authority is an authority whose approval is required under state water management law for a trade to proceed, for example Lower Murray Water or NSW Office of Water. Approval authorities are required under the water trading rules to notify the parties involved in a trade when a trade is restricted or refused. The approval authority must also provide reasons for its decision. Approval authorities are required to disclose any legal, commercial, or equitable interest they have in a trade to all parties when processing trades of water access rights. These rules will improve information flows via an open and transparent process for approval authorities. The water trading rules introduce requirements for Commonwealth and Basin State governments to make water announcements generally available. Water announcements include announcements on allocations, carryover (including changes to carryover arrangements), trading restrictions and trading strategies. The rules also require persons or organisations to refrain from trading activities when they are aware of a water announcement that has not been made generally available. In some instances, agencies may perform multiple functions associated with the water market, e.g. water announcements, trading approvals and/or trading activities. In these instances, the rules permit an agency to implement Chinese wall arrangements to assist in managing information within the agency. These rules aim to enhance confidence in water markets by restricting inappropriate disclosure of sensitive water market or trading decisions and restricting persons with prior access to these decisions from trading in those markets. The water trading rules require that Basin States provide the MDBA with information about the characteristics of water access rights on issue in their State, and the trading rules in their State. The MDBA is then required to publish this information. These rules aim to improve information flows by making information about water access rights available in one central location. Access to accurate information is critical to a well-functioning market as it allows participants to make informed decisions. An exchange rate is a method used to manage the trade of water access entitlements between trading zones. An exchange rate is a conversion that accounts for differences between water access entitlements including differences in transmission losses and changes in reliability. The water trading rules restrict the use of exchange rates within and between regulated systems to assist in managing possible impacts on water availability for third parties. Tagging is a method by which the water that becomes allocated to an entitlement issued in one location can be physically taken in another. The entitlement is 'tagged' on a state water register, allowing the water to be taken at the different location. The water trading rules ensure that water delivered through a tagged water access entitlement does not receive differential treatment to water delivered by a trade of water allocation. These rules restrict the delivery of water under a tagged water access entitlement established on or after 22 October 2010. Typically trade in groundwater tends to be more restricted than surface water because third party impacts are potentially greater and are less understood. The water trading rules prohibit the trade of groundwater unless certain conditions are met, to avoid undesirable impacts of third parties or on the resource itself. This differs to the rules for surface water, which require free trade unless there is a necessary reason to restrict it.